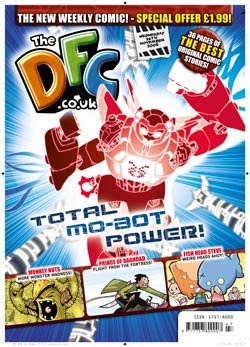 I’ve just heard that everybody’s favourite new kids comic the DFC is going to be available to buy in Tescos for one week only this week, so if you’re interested in taking a look, but don’t want to fork out for a subscription, now’s your chance – I think the issue is only going to be £2 and it’s full of top notch strips, so it’s definitely worth a look. Unfortunately my strip ‘Super Animal Adventure Squad’ isn’t going to be in this issue – I won’t be appearing again for a few more weeks yet, but here’s a sneak peek at a little christmas special I’m working on – if all goes well I should be able to show you the complete episode in a couple of weeks time! Ho ho ho oh no! This entry was posted in News and tagged aliens, beans, dfc, santa, tescos on November 26, 2008 by eruditebaboon.